From Wired magazine to CNN, BBC Radio 3 and the Telegraph, the impact of our Interdisciplinary Centre for Computer Music Research’s groundbreaking work has been reported far and wide. Computing technology is ubiquitous in all aspects of music, and understanding the relationship between the people who make music happen and computing technologies is pivotal for the future of the music industry. From avant-garde contemporary music to entertainment media for mass consumption, smart sound design and synthetic music pervades a wide range of creative practices. The ICCMR is affiliated to the University’s Centre for Research in the Humanities, Music and Performing Arts and to the Cognition Institute. 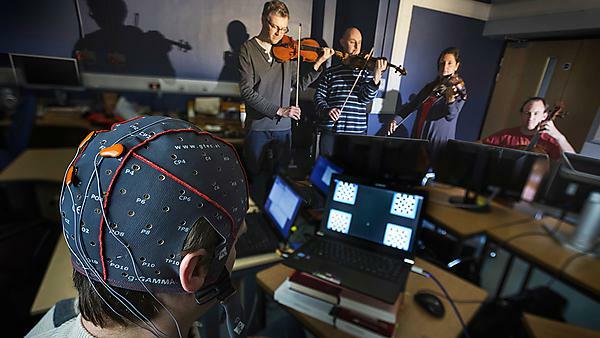 It offers a number of unprecedented opportunities for collaborative and interdisciplinary research with theatre, dance, psychology and neuroscience. The Centre also has an excellent funding track record, with over £2.5m raised to fund its research within the last few years. Find out more on the ICCMR website. Postgraduate students and research staff have access to well equipped studios, an open plan lab with exciting kit, annual research seminar series and a vibrant contemporary music community. Professor Eduardo Miranda, Head of ICCMR. A showcase of extraordinary new technologies and approaches to composition and performance that are pushing the boundaries of music. The Contemporary Music Festival is organised in partnership with the Interdisciplinary Centre for Computer Music Research (ICCMR).